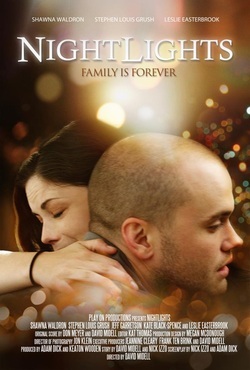 "NightLights" is the bittersweet story of Erin Logan, a young woman in the prime of her life and sole caretaker for her twin brother Jacob, who is severely affected by autism. Erin and Jacob live in relative solitude, but new chances at life and friendship with Nicole, her new quirky neighbor, open possibilities for Erin. NightLights follows Erin through her journey as she begins to question what it means to have a good life, and whether what's best for her and Jacob are one and the same. The filmmakers, cast, and crew of NightLights worked hand-in-hand with a variety of institutions and individuals throughout the country to ensure that NightLights portrays families with autism with the authenticity, dignity, and love these everyday heroes deserve. This movie won Kate the "Best Supporting Actress" Award at the Blue Whiskey Independent Film Festival in 2014. After Karen has been the primary at-home caretaker of baby Oliver, she needs to go out of town and Martin is left alone with their one-year-old son for the first time. Alone, Martin starts to hear strange and terrifying noises coming through the baby monitor that leads him to wonder if he's losing his mind, or if Karen is trying to send him a message from beyond. Sleep deprivation and supernatural visions threaten Martin's sanity as he is forced into a confrontation of his own fears of fatherhood. After the first season of #Hashtag left Skyler, a stand up comedian, was confronted with kissing her best friend's ex. Season 2 picks up with all the drama that ensues and takes Skyler on a more disorganized downward spiral in this social media-obsessed modern lesbian love story. tello Films develops a new webseries focused on the struggles of LGBT youth, turned away by their families, forced to live on the streets, and the tight-knit relationships they form when in dire circumstances. By Any Other Name has been accepted into the Sprout International Film Festival in New York City, the Jeju Disabled People's Human Rights Film Festival in South Korea, as well as the International Culture Unplugged Film Festival. The film has been featured in both film and educational seminars, and has been purchased by educational organizations around the country. To order a copy of By Any Other Name, contact David Midell at david.midell@playonproductions.net.